This question is based on an answer I posted on the “Movies and TV” Stack Exchange which asked about how Darth Vader discovered Luke Skywalker was his son and how the logic/rationale over the years seems to have changed to the point of… Arrrgh! Long story short: Depending on what version of the script/movie existed, Darth Vader either always knew who Luke Skywalker or was clueless/oblivious. But if—as implied in the 2004 DVD re-dubbing/re-working—Darth Vader first learns about his Luke being his son from the Emperor… Then where—or how—did the Emperor discover this information? Or did the Emperor know all along and was just holding onto the info until just the right moment to push Darth Vader’s buttons? Is the mention of Skywalker in this opening crawl just a high-level narrative clarification for the viewer or did Darth Vader actually know who Skywalker was and by the time the audience is viewing The Empire Strikes Back we are watching an obsessed Darth Vader on a personal revenge mission? 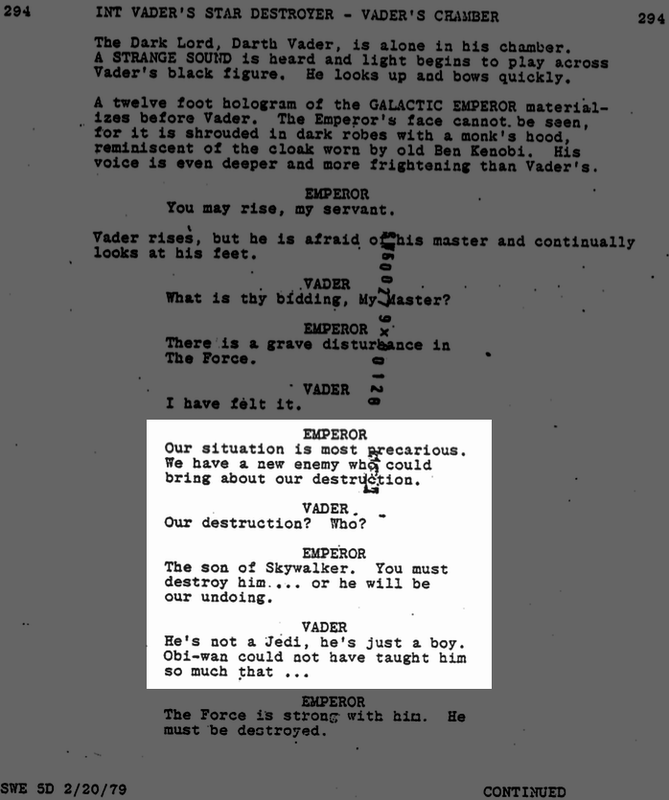 The 1980 film dialogue of the Darth Vader and Emperor conversation implies Darth Vader knows who Skywalker is and the Emperor is a bit clueless. The 2004 DVD re-dubbing implies that Darth Vader is clueless and the Emperor is the one who knows who Skywalker is. Here are script changes that make my head spin. The fifth draft of the script implies Skywalker is just some guy they need to hunt down. EMPEROR: Our situation is most precarious. We have a new enemy who cold bring about our destruction. EMPEROR: The son of Skywalker. You must destroy him … or he will be our undoing. The 1980 release dialogue implies Darth Vader knows who Luke is, but his hiding this information from the Emperor. EMPEROR: We have a new enemy - Luke Skywalker. The 2004 re-dubbing makes it seem that Darth Vader is oblivious to his children and the Emperor is the one who breaks the news. EMPEROR: We have a new enemy, the young rebel who destroyed the Deathstar. I have no doubt this boy is the offspring of Anakin Skywalker. VADER: He is just a boy. But this 2004 retconned logic makes Darth Vader completely submissive to the Emperor who is “all knowing.” But how did the Emperor know who Luke is and his connection to Anakin Skywalker? Was this just a bit of knowledge the Emperor proverbially “Saved for a rainy day?” Is this something from the prequels I missed or is it something else? 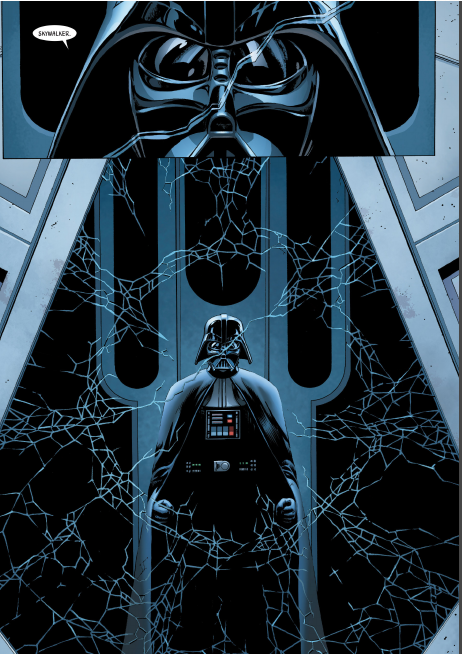 This is the main thrust of the current run of the Star Wars and Darth Vader comics that take place between A New Hope and Empire. It is "Disney canon" (official canon post-Disney purchase). Star Wars (2015) #1-4: Luke encounters Darth Vader on a mission to destroy an Imperial weapons factory. They have a short conversation where Vader realizes Lukes connection to Obi-Wan, recognizes his old light saber, and says the great line "I have killed many fathers". Darth Vader (2015) #1: Vader sends Boba Fett after him with the description "There is an X-Wing pilot. He... knew and Obi-Wan Kenobi. He left this planet aboard a smuggling vessel called the Millenium Falcon. Star wars (2015) #5-6: Luke returns to Tatooine to look for information in Ben's old hut. Also, Boba Fett is looking for him and beats the nickname Wormie and the name Skywalker out of one of Lukes old "friends". Luke gets away but Boba Fett returns to Vader with the name "Skywalker". Even if you don't consider the Disney comics to be canon, it is improbable that the Rebellion was able to keep the names Skywalker and Solo from Imperial intelligence for very long. Especially after the ceremony at the end of A New Hope. Both the Emperor and Vader probably know about his role in the destruction of the 1st Death Star long before that conversation. And with Vader offering Luke help to overthrow the Emperor later in the movie, one would assume that he already has his own plots in motion. The Emperor is a politician, and politicians live to gossip, a characteristic that Palpatine clearly has as you can see in Episode I: The Phantom Menace. It is easy to speculate that the Emperor got the knowledge via gossip. Why Vader is so oblivious to the existence of his own son isn't so hard to understand. He passed through a very traumatic near-death experience in which he lost a lot, physically, mentally, and emotionally, leaving few memories of his old self. He doesn't even use his own name and is heavily manipulated by the Emperor. If he remembers that he had a son - he never saw him in person - he may remember him as a baby. But if he knows about Luke and Leia, he can hide that knowledge to protect them. When the stormtroopers are on Tatooine looking for the droids, they kill Vader's step-brother and sister-in-law. I doubt Vader would have left anything that important to a troop of stormtroopers. He would have most likely discovered Luke's existence then. Though there is no direct evidence of Vader's involvement with the murder of his step brother. They are on the same farm and anything occurring there would be suspect to him. Not the answer you're looking for? Browse other questions tagged star-wars darth-vader luke-skywalker the-empire-strikes-back darth-sidious or ask your own question. Prior to The Empire Strikes Back, did anyone predict that Darth Vader is Luke's father?